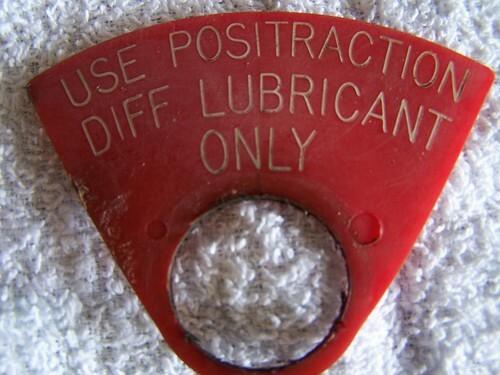 For posi differentials....was the red triangular 'Use Positraction Diff Lubrication....." tag on the fill plug when the assembly was painted black? Or was it installed afterwards. I assume if it was on the fill plug prior to painted that it would be masked somehow. And did the original tag have a slit on the end to slip over the plug neck. Mike, this would be a good question for John. I'll see if I can get him to reply. In the meantime, here's what I believe. The axle was painted at the axle assembly plant (i.e. the Detroit Gear and Axle plant), but not filled until it got to the vehicle assembly plant (Norwood or Van Nuys). This leads me to believe that some kind of plug or cover may have been used to cover the fill hole when the axle was painted, and then the plug and tag (which came as a "unit" - P/N 3866433 - see below) installed after the axle was filled. Of course, this is just a guess on my part, but it seems to me that if the "unit" were painted at the axle plant, it would be difficult at best to completely mask off the tag and I don't recall ever seeing any overspray on any posi tags. The axle left Detroit Gear & Axle with no lube, but with the 4-sided plug in the fill hole. On the Chassis Line at the car assembly plant, the plug was removed, the axle was filled (with Posi lube if it was a Posi, or with regular hypoid lube if it wasn't), and the plug was re-installed (with the red plastic Posi tag added if it was a Posi axle). The "unit" shown was a Service part for the dealers. Thanks Ed and John. And welcome back, John! From what I have seen (Bryon) the paint that was used was cheap and didn’t stay on very long on most cars. And I don’t remember seeing any tags that were split. Did the assembly-line posi tags have 'DIFF.' or 'DIFF'? Yes, what did the assembly line tags look like? I asked this a few years back and it was DIFF. Was it “DIFF.” for just ‘67 or was it that way for ‘68 and ‘69 as well? Our 68Z had the "Diff." with the period and if I remember correctly that is what the NCRS judging manual states. Hmmmmm....ALL of the Camaro vendors sell a ‘68 and up tag with a 3/4” hole that have “Diff” without the period. Paragon sells one with the period but the hole looks to be 1”. Did the ‘68 and up tag use a 3/4” or 1” hole? 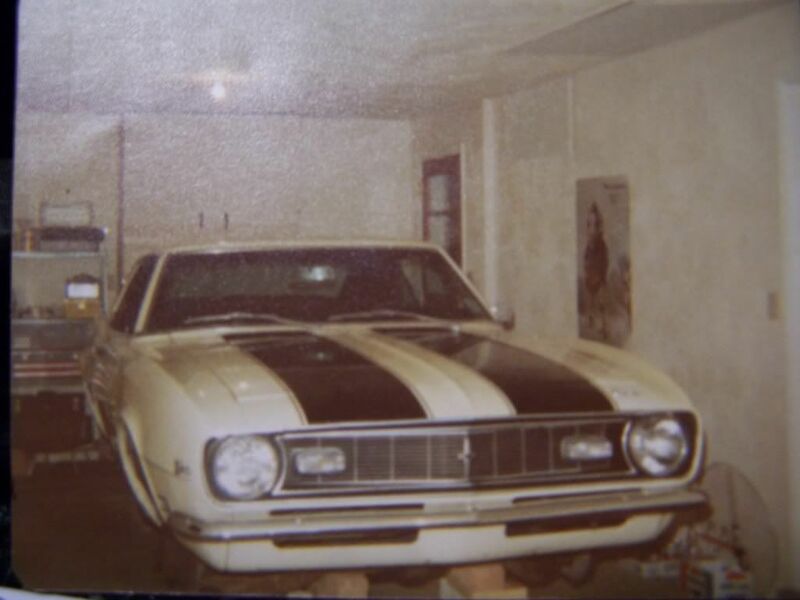 Is this a case where the Camaro repro parts are yet again wrong? Yes, through late 1967 production the plug was 3/4 x 14 (Service P/N 3866433 - "Plug & Tag"), then starting late 1967 production (exact date unknown) and after, the plug was 1/2 x 14 (Service P/N 3931171 - "Plug & Tag"). 1. All ‘67-‘69 tags should have the period after “DIFF” regardless of the diameter of the threaded portion of the plug. 3. The tag being sold by Paragon (https://www.paragoncorvette.com/p-359540-rear-differential-carrier-tag-posi-traction.aspx) has the period after “DIFF” but with the larger diameter tag hole which, for example, contradicts what the Camaro repro suppliers are advertising for the ‘68 and ‘69 tag. Did the Corvette use a different plug that would use the larger diameter tag hole? Will this tag work with the later 1/2” Camaro plug? Original tag from our 67 Corvette has the period after DIFF.